In a world-first clinical trial, Melbourne medical researchers have shown that patients with an advanced form of leukaemia can achieve complete remission with a novel tablet treatment. Clinical trials of the potent new anti-cancer drug venetoclax showed it was effective in killing cancer cells in people with advanced forms of chronic lymphocytic leukaemia (CLL) when conventional treatment options had been exhausted. Seventy-nine per cent of those involved in the trial had promising responses to the breakthrough therapy – including twenty per cent who went into a complete remission. A small number of patients had such a profound response that even very sensitive tests were unable to detect any remaining leukaemia in their bodies. CLL is one of the most common forms of leukaemia, with around 1000 people diagnosed with the cancer in Australia every year. The results from the trials conducted at The Royal Melbourne Hospital and the Peter MacCallum Cancer Centre, in collaboration with the Walter and Eliza Hall Institute, as well as trial sites in the US, were published in the New England Journal of Medicine. Professor Andrew Roberts, a clinical haematologist at The Royal Melbourne Hospital and head of clinical translation at the Walter and Eliza Hall Institute, said most trial patients responded positively to the therapy, showing substantial reductions in the number of leukaemia cells in their body. “Many patients have maintained this response more than a year after their treatment began, and some patients remain in remission more than four years on,” Professor Roberts said. The drug has been granted Priority Review status by the US Federal Drug Agency (FDA) for treating some types of CLL. The designation is granted to medicines that the FDA has determined to have the potential to provide significant improvements in the treatment, prevention or diagnosis of a disease. Venetoclax was developed based on a landmark discovery made in the 1980s by Walter and Eliza Hall Institute scientists that a protein called BCL-2 promoted cancer cell survival. Venetoclax was co-developed for clinical use by US pharmaceutical companies AbbVie and Genentech, a member of the Roche group, and was discovered by AbbVie scientists as part of a joint research collaboration that involved Walter and Eliza Hall Institute scientists. Professor Roberts said the drug works very specifically by overcoming the action of BCL-2. “High levels of BCL-2 protect the leukaemia cells from dying, so the leukaemia can grow and become resistant to standard treatments. Venetoclax selectively targets the interaction responsible for keeping the leukaemia cells alive and, in many cases, we’ve seen the cancerous cells simply melt away,” Professor Roberts said. “The fact that a targeted drug, given on its own, can produce such a profound reduction in the leukaemia burden in the patient, to the point we cannot find the leukaemia even with our best tests, underscores what a powerful strategy targeting the BCL-2 gene is,” said Professor John Seymour, Chair of the Haematology Service at Peter MacCallum Cancer Center. Phase 2 and phase 3 studies are currently being undertaken to test venetoclax across a range of blood cancers globally, including at many sites in Australia. Victorian institutions involved in this study, The Royal Melbourne Hospital (Melbourne Health), Walter and Eliza Hall Institute and Peter MacCallum Cancer Centre, are three of the ten organisations that make up the new Victorian Comprehensive Cancer Centre, a powerful partnership committed to cancer research, treatment and care. 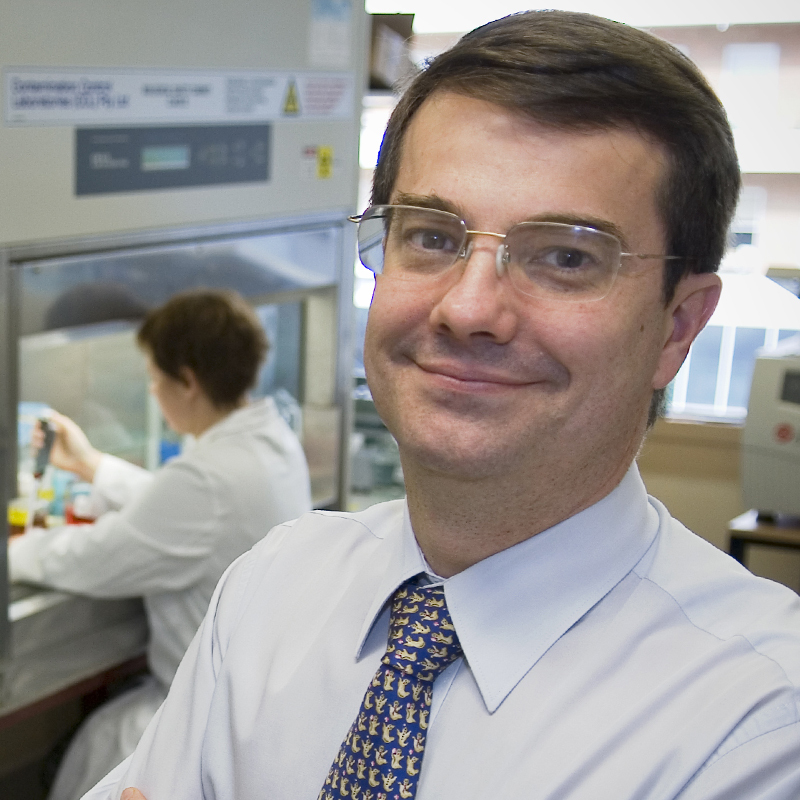 “The clinical trials of venetoclax have been led by researchers within the VCCC, and demonstrate the power of this initiative in enabling world-first research to happen in Victoria, and bringing better treatments to Victorians with cancer,” said Professor Roberts, who is also the inaugural Metcalf Chair of Leukaemia Research at the University of Melbourne. The trial was funded by AbbVie and Genentech (a member of the Roche Group). The researchers were also supported by the National Health and Medical Research Council, the Leukaemia & Lymphoma Society (US), the Webster Bequest, Cancer Council Victoria, the Australian Cancer Research Foundation, the Victorian Cancer Agency and the Victorian Government Operational Infrastructure Support Program. Professor Andrew Roberts discusses the results of a clinical trial of a potential new anti-cancer agent on ABC Radio.